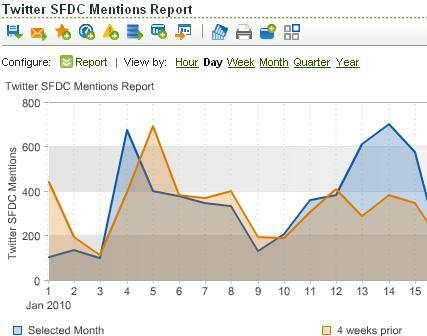 One of the holy grails of online marketing teams is to find a way to track and measure a company’s Brand Awareness. There are many different approaches to do this including the use of products like comScore, Compete, Twitter, but more often than not, it takes place offline in research studies. While this trend is not going to change anytime soon, as a web analyst, you may be looking for data that you can collect to provide an estimate of your Brand Awareness. Therefore, in this post, I wanted to share a “quick and dirty” way to use online data to see and trend the popularity of your company brand. While this will not be a comprehensive approach, it might provide a basic starting point into the larger “Brand Awareness” puzzle. If you are part of one of these companies, the above question is often followed with a spirited debate about whether success should be judged by lead counts, unique visitors, visitor engagement, etc… At some point one Marketer will say that the website should be used to build Brand Awareness so success should be judged by increasing Unique Visitors, only to be countered by another saying that Unique Visitors don’t mean anything if they aren’t the right types…After about an hour of this, there is rarely a consensus on how to judge the success. Soon you can see why this is not a popular topic in Web Analytic circles! Amid all of this confusion, I think that people sometimes forget the real reason that people care about Brand Awareness. At the end of the day, you want to measure how often consumers that are interested in a product/service that you provide think of you when the time comes to research or buy that product/service. If you are doing a really good job at branding your company such that you are top of mind when consumers are at this stage, then one way or another you have done something right. This is why I think there is some value in trying to quantify this and trend it over time. So What Can Be Tracked? Come to your office and ask to see your salespeople? Pick up the Yellow Pages and give you a call? Mail you a letter asking for information? Maybe in the 1980’s, but not today! Most are going to go to a Search Engine and a few savvy ones will go to Twitter. So if the bulk of these will go to a Search Engine, and you are truly “top of mind” from a branding standpoint, they would probably search for your company name or the name of one of your products. For example, if the consumer is looking for a “CRM” product they might search for “CRM.” But if you are doing your job and have an awesome brand such that the first thing people think of when they think about “CRM” is your company brand (I don’t know…maybe something like “salesforce.com” ;-)), then you would know that your brand is alive and kicking! Following this logic, you can see that one interesting way to track your brand awareness is to quantify how often people are coming to your website from a list of “Branded” keywords of your choosing. This list of keywords would include your company name, product names, key executive names, etc… If you can aggregate these SEO keywords (I wouldn’t include Paid Search Keywords), then you have a number that you can trend over time. Keep in mind that this is not an exact way to track brand awareness, but the logic behind it is that the more people [organically] search for your key brand phrases, the more pervasive your brand is out there. In my consulting experience, I have often found that the number of SEO Brand Searches has a direct correlation with other key website success metrics. So How Do I Implement SEO Branded Keyword Tracking? In a perfect world, it would be great if there were an easy, reliable way to track how often your brand keywords were searched on all of the major search engines. 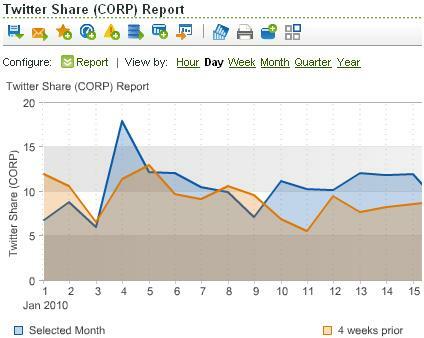 Companies like comScore try to estimate this, but it is not always accurate due to the panel-based methodology. Another way I have tried to get at this data is through Google Trends, but I have not found ways to automatically export that data through API’s (if you know how please let me know!). Work with your Marketing team to identify the list of keywords that everyone agrees are “Brand Keywords.” In order to not distort the trend, it is important that you not continually add to the list so try and get an exhaustive list and stick to it for an extended period of time (i.e. readjust yearly). 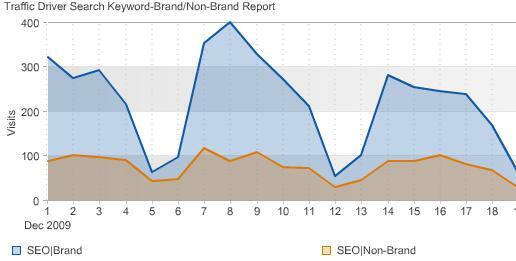 The next step is to isolate these Branded Keywords in your SEO reports. One way to do this is to add each one to the advanced search criteria for your SEO Keywords report (in the interface or ExcelClient), but if you have a lot this can be difficult. My preferred approach is to pass SEO Keywords to a custom eVar. Once you have done this, you can use SAINT to classify these keywords as “Branded Keywords” and then use the trended view of reports. If you are using the Channel Manager plug-in or the Unified Sources Vista Rule, you should already have the data you need in a custom variable. If you’re logged into your Google account you can also export this data. Again, the data uses some relative numeric values so they are in no way precise. I’d recommend that you grab impression data from your AdWords account for one of your primary brand terms to use as a benchmark for this data. Sorry for this questions, but how to “pass SEO Keywords to a custom eVar.” How exactly does this work in Omniture?